There should be both affordable housing for rent and to buy, Mr Cameron said, but “a shift towards more affordable housing to buy” was needed. Lending figures from the Halifax on Monday showed that 26 per cent of first time buyers across the mortgage market took out a 35-year mortgage in 2015, compared with 30 per cent who had a mortgage term between 20 and 25 years. As recently as 2007, the shorter mortgage dominated with 48 per cent of loans. Only 15 per cent were for 35 years. We have discussed before the trend towards longer mortgage terms and this is some more evidence of it. The catch for the “affordable housing” theme is two-fold from this. Firstly we have in the background the influence of the fact that we have not only record low official interest-rates or Bank Rate but we have been seeing record low mortgage-rates too. So if terms are lengthening with what are ultra-low mortgage rates we are seeing evidence of the opposite of affordable homes. Another way of putting this has been shown by Neal Hudson of Savills. As you can see such a change turns out to be very expensive. Or as it is put in modern official documentation for student and nursing loans an opportunity albeit one with a Orwellian flavour. How much have mortgage interest-rates fallen? Unfortunately the Bank of England has not kept up many of its time series on the subject but we do have the 2 year fix data for those with a 25% deposit. That entered the credit crunch at what now seems an unseemly 6%. The Bank Rate cuts (to 0.5%) took it to 4% but the QE era (£375 billion) had very little impact especially when we consider the size of it. The problem was that when we saw lots of it this mortgage rate fell to just below 3% but as it reduced and then moved towards Operation Twist we saw our mortgage-rate rise to 3.7%. 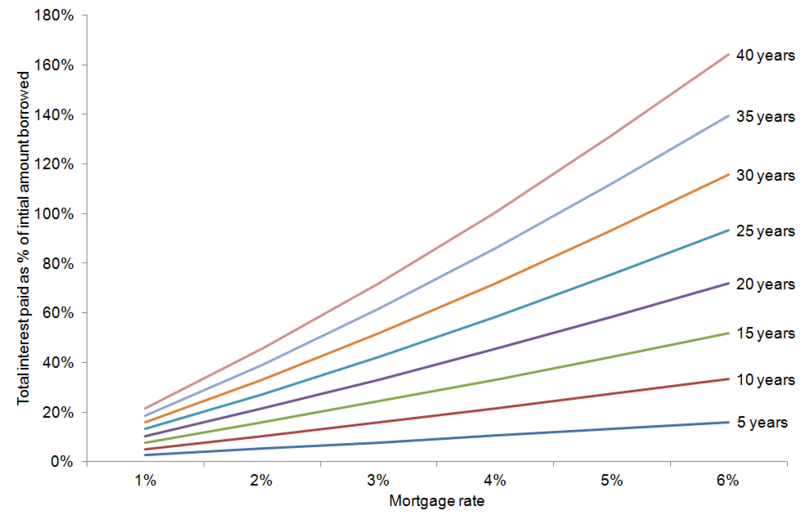 So the net QE effect at this point on our mortgage rate was a minor -0.3%. It is easy to forget now but back in 2012 the UK was facing fears of stagnation going as far as fears of a “triple-dip”. Thus as regular readers will be aware the most bank and house price friendly move appeared on the scene in the summer of 2012 called the Funding for Lending Scheme. It is applied by the Bank of England but is backed by HM Treasury in yet another apparent demonstration of what is called “independence” by many. Our mortgage rate of 3.7% fell by 1% over the next year and in fact continued to fall passing 2% this time last year and is now 1.89%. That is less than a third of what it was pre credit crunch. There has also been a further change which is that higher risk mortgages have benefited by even more than that in the FLS era. What I mean is that the gap between the 25% equity mortgage quoted above and one with 10% equity has narrowed from over 2% to more like 1%. So higher risk mortgages have benefited by even more. The data here is stark if we look at the official series. In October 2015, the UK mix-adjusted house price index increased by 0.1% from the previous record level witnessed in September 2015 to reach a new record of 220.1 The UK index is 18.7% higher than the pre-economic downturn peak of 185.5 in January 2008. In this sense the credit crunch was indeed just a blip before what is regarded as normal service was resumed. However real wages are still lower than what they were in spite of the improved performance last year. The peak for this series was 118 where it remained as 2007 moved into 2008, but now we reflect on a much more subdued 111.4 for October 2015. So real wages have fallen by 6% over the credit crunch era. Also we need to note that the official CPI series for consumer inflation will under record the fall in real wages when compared to the various RPI derivatives. So the 18.7% rise in house prices and the 6% fall in real wages according to the official data poses a very eloquent challenge to concepts of “housing affordability”. It also reminds us of my argument that there is inflation in the UK economy if you bother to look. You may not be surprised to learn that this has been rising inexorably higher in response to the developments above. It is now at 5.31 compared to 4.4 as FLS began. Rather chillingly for Londoners like me the Greater London number is 7.96. For newer readers care needs to be taken with the exact numbers as the definitions have been chosen to keep the number as low as possible but the pattern is clear even if it is hard not to have a wry smile at the claim we are not yet at the pre credit crunch peak. However we can learn something from the ch-ch-changes. What about those who rent? These are of course an increasing number which poses its own critique for housing affordability! Your Move put it this way last week as it noted a rise in rent arrears. Over the last decade the private rented sector has expanded at an unprecedented pace, providing homes for millions of households. Back on April 27th last year I looked at the state of play using some Your Move data. increase each year over the last Parliament. If we bring their data up to date we see this. Across England & Wales annual rent rises stand at 4.0%, comparing November 2015 with November 2014. Taking into account CPI inflation of 0.1%, this leaves real-terms annual rent rises of 3.9%. The recent numbers are not as bad against wages ( up 2.4% in the year to October) but there is still a continuing affordability decline. The most recent Your Move report covers off this angle and for these times of low interest-rates and returns these are stellar numbers. Taking into account both rental income and such capital growth, the average landlord in England and Wales has seen total returns of 10.9% over the twelve months ending November 2015 – up from 10.4% in October 2015. In absolute terms this means that the average landlord in England and Wales has seen a return of £19,668, before any deductions such as property maintenance and mortgage payments. Of this, the average capital gain contributed £11,057 while rental income made up £8,611 over the twelve months to November. Of course you do not need to take my word for all of this because government policy confesses to it. After all if we had housing affordability why is Help To Buy necessary? This is currently being displayed in the form of two types of bribe as show below. So we have bribe number one which with other schemes has had people speculating as to how much support you might get. Next we have bribe number two. The new Help to Buy: ISA pays first-time buyers a government bonus. For example, save £200 a month and we’ll add £50, up to a maximum of £3,000, boosting your ISA savings of £12,000 to £15,000. Those who have an ordinary ISA may mull an interest-rate of up to 4% also (Halifax) which compares to this reported by the BBC. The average rate on Individual Savings Accounts (Isas) fell to 0.85% in December, down from 0.99% in November. Ordinary savers may reasonably be wondering if they are cross-subsidisng this as will those seeing rises in bank fees too. Meanwhile first-time buyers see that apparently affordability means higher house prices and lower wages. As to the destruction of high-rise blocks then as someone who has seen their impact in London I welcome that. Except the problem with new housing is that it is on average smaller a particular irony as we have got larger both in height and weight. I also wonder how it works that we can build more on a plot of land with a high-rise block.